Well I guess I should start with some background. I’ve been hunting for 24 years and bow hunting for the last 19 year’s. I have taken good deer with the gun, but never with bow. Although I have taken plenty of deer with the bow, none have been of this caliber. Anytime I have seen “shooter” bucks they are either too far out of range, at a poor shot angle, or running a doe past the tree at 100 mph. Frustrating and disappointing at best. But every fall I can’t wait to get in a tree. So this year was no different. I put out the trail cams at the end of August. Had several pictures of good bucks and 3 or 4 that I would classify as “shooter” bucks. One of these bucks I had an encounter with last year. 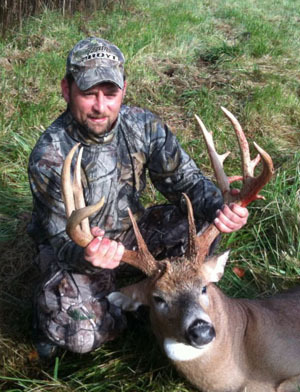 A main frame 10 with split brow tines on his right side and bladed brow tine on the left side. So I was pretty excited to see that he had double split brows this year and had a kicker off of his G2 on his left side. So on October 22, 2011 my brother and I decided to go to this property in Ontario County to see if we could get this deer. The property is open field surround by hedge rows, hardwoods, and thickets with a creek running through it. As I left the truck I had a feeling that something was going to hit the ground. When I got closer to the stand I put Evercalm scent on my boots. I got in the stand we call the cherry tree stand, which is at an inside corner of the property, and my brother got in a stand at the opposite corner approximately 180 – 200 yards away. At about 8 o’clock I had noticed some does that had entered the field, headed to a mowed path that split the field in half. At the same time a 4 point had entered the field near my brother. When the doe’s reached the path they turned and started walking toward my stand. When the lead doe reached the spot where I had turned off the path to go to my stand she stopped, sniffed the ground and came right to the tree. At 20 yards I let the arrow fly. She ran about 80 – 90 yards and piled up. This was about 8:20 a.m.
After texting my brother and talking to him on the phone about the doe, we decide to stay on stand as it was still early. The 4 point had never left the field the whole time this was going on, and eventually made his way down to my tree and was feeding in the field not 15 yards from where I had just shot the doe. At about 8:40, as I was getting ready to fire off a text to my brother about the 4 pointer, I looked up to see a small doe running down the edge of the field at full speed heading to the hardwoods. At first I thought, "What is she running from? ", but before I could actually finish the thought I saw this monster running about 60 yards behind her. At first glance all I saw was all the sticker points on his left side and thought, "Holy @#!t!" But, the excitement was followed by a feeling of dejection as the doe blew past me at about 70 yards to my left into the woods. I thought for sure that once again I was going to be witness to a “shooter” blowing past me chasing a doe and never seeing it again . The corner of the field to my left drops of into about a 20’ deep bowl before it enters the woods, so I didn’t realize that the doe had stopped about 30 yards inside the wood line until "Stickers" stopped in the field about 40 yards short of the woods. It was then that I started wishing that he would turn and walk up out of the low corner and see the 4 point that was still under my tree. At that moment I could hear the doe start running through the leaves. As the noise got louder I turned to look for the doe only to realize she was running directly to my stand, but still just inside the wood line. She stopped about 30 yards away from my stand and looked out in the field at "Stickers". In what I believe was an attempt on his part to cut her path off he came up out of the bowl and headed for my stand. That’s when he saw the 4 pointer. He turned and started heading his way. By now my release is locked on my string loop and I was just waiting for him to clear one last bunch of limbs. As he got closer to the 4 pointer he turned and walked away from me and made a half circle back to face off with the smaller buck. As he turned broadside I put the 40 yard pin in the lower 1/3 of his body and released the arrow. The nerves and adrenaline set in after and I thought I was going to fall out of the tree. My brother was standing on the seat of his stand and watched the whole thing unfold. Later that night while looking through last year’s picture’s we realized that we had this same deer on film which is when we gave him the nickname "Sticker’s". Four days after taking this animal I checked the cameras again only to find we had 2 pictures of him the same morning I shot him. He green scored 165 2/8” non-typical. He had 5-7/8" bases, brow tines just under 6”, and G2’s 11+ inches. Awesome! Will never forget it.